Researchers on the EU Eccerobot project are working on a new type of humanoid robot that will eventually not just look like a human, but also move and act like one. The artificial muscles of this still rather scary looking model are set in motion by precise DC drives from Maxon Motor Australia . Humanoid robots have been the focus of public interest for years, provoking different types of emotion in us. Some people are fascinated by the progressive technical aspect, while others are wary of the soulless perfection of these machines. There are many examples of such robots such as Honda's Asimo, the Korean Institute of Technology's Einstein robot Albert HUBO or the female robot HRP-4 C developed by Japan's National Institute of Advanced Industrial Science and Technology and Kawada. They all make an impression when they appear at exhibitions, run, swerve around people or shake hands with them. They are normally designed as industrial robots, in that their hands, arms and legs are stiff, metallic limbs that are turned and bent by electromotors, many of which are made by Maxon Motor. However, two-legged robots today function incredibly well although simulating the human gait is particularly challenging. The human body constantly resets its centre of gravity in parallel with other changes in its support points and in line with many other factors. The more fluid a robot's movements are supposed to be, the more precise the positions of the individual limbs have to be calculated and carried out. This involves an enormous amount of data and the smallest error can make a robot fall over. 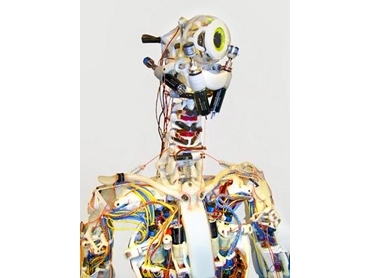 The EU Eccerobot research project has adopted a completely new approach by building anthropomorphic robots with bones, muscles and tendons. In a recent interview, project leader Owen Holland stated, "We are looking to build a robot that not only looks like a human being, but also copies the inner structure and mechanisms of the human movement apparatus." Eccerobot is designed to react individually to various situations and respond to its environment as it would need these characteristics to cope with day-to-day life as a robotic butler in the home or as a nurse in a hospital among other potential uses. Eccerobot is a skeleton supporting muscle attachments. The bones are made of polycaprolacton (PCL), also known as polymorph. This softens at 60°C and can be molded as required. Polymorph hardens when cooled, which means that it can easily withstand tensile forces. But in doing so, it also retains a certain degree of elasticity. There are 80 actuators housed in the entire robot, one for each muscle. They comprise a Maxon motor with gearbox and encoder, a spindle, a piece of kite line and a rubber band. The Eccerobot's arm comprises two polymorph bones to which the artificial muscles are attached. The kite line attaches the spindle on the gearbox to the rubber band which is fixed on the other side on the bone. To flex the muscle, the DC motor uses the gearing to turn the spindle on which the kite line unfurls. By doing so, it slowly raises the lower arm using the elastic rubber band. Maxon Motor supports forward-looking projects in a variety of areas. It has formed a partnership with the Artificial Intelligence Laboratory (AI Lab) of the University of Zurich for developing ideas such as Eccerobot. The AI Lab is involved in numerous projects at the international level, which means that the latest scientific findings can also be directly incorporated into Maxon Motor's developments. "We are impressed by Maxon Motor, but not just by the high quality of its products, the efficient and friendly customer service and the high competence of its staff. It is the unique culture of innovation and the readiness to come up with unconventional solutions that make Maxon Motor and AI Lab successful partners," said Pascal Kaufmann, Researcher and Head of Joint Ventures at AI Lab. In future, all actuators for the Eccerobot and all humanoid robots at the AI Lab will be fitted with Maxon Motor's precision drives, gears and sensors.